张晗, 王志会, 王丽敏, 齐士格, 李志新. Zhang Han, Wang Zhihui, Wang Limin, Qi Shige, Li Zhixin. Zhang Han, Wang Zhihui, Wang Limin, Qi Shige, Li Zhixin. Study on activities of daily living disability in community-dwelling older adults in China[J]. 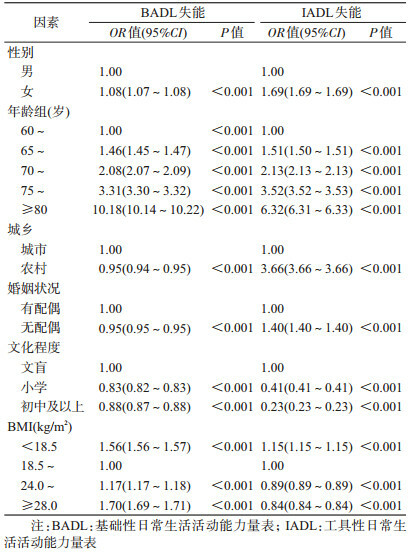 Chinese Journal of Epidemiology, 2019, 40(3): 266-271. Abstract: Objective To investigate the disability status and its epidemiological characteristics in the elderly in urban and rural communities in China. Methods The participants were from the project of Prevention and Intervention on Neurodegenerative Disease for Elderly in China conducted in 2015. A total of 23 803 urban and rural residents aged over 60 years were selected through stratified multi-stage cluster sampling in 6 provinces for a set of standardized questionnaire interview and physical examinations. Activities of daily living (ADL) scale was used to assess the disability status of the elderly. 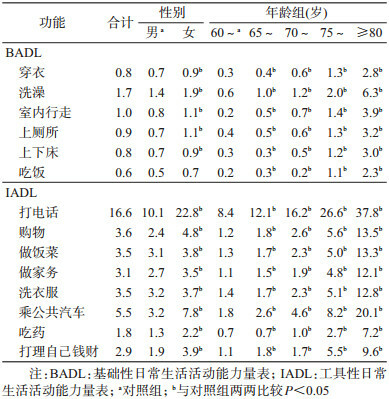 χ2 test was used to analyze the difference in basic activities of daily living (BADL) and instrumental activities of daily living (IADL) disabilities in different elderly populations. Multivariate logistic regression model was used to analyze the influence factors for disability. Results Taking bath had the highest impairment rate (1.7%) while eating had the lowest impairment rate (0.6%) in BADL. Making phone call had the highest impairment rate (16.6%), followed by taking bus (5.5%) and taking medicine (1.8%) in IADL. The BADL and IADL disability rates in community seniors were 2.1% and 19.1%, respectively. BADL disability rate was higher in females, the widowed, illiterate, the elderly with low body weight or obesity (P < 0.05). IADL disability rate was higher in females, rural residents, the widowed, the elderly with lower educational level or lower body weight (P < 0.05). Multivariate analysis showed that risk for BADL disability increased with age and abnormal BMI, and decreased with the increase of education level. The risk factors for IADL disability included being female, age, rural residence, being widowed and low BMI. The risk for IADL disability was lower in those with higher education level and overweight or obesity. 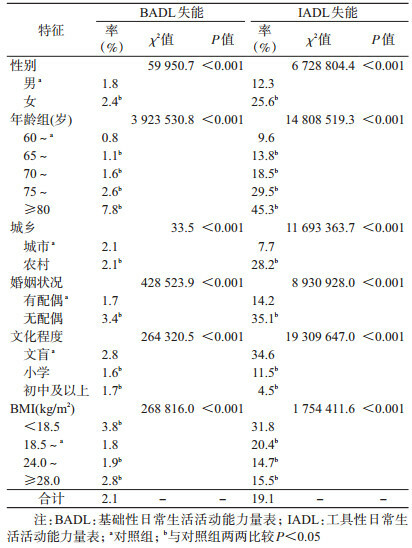 Conclusion The present study showed that the disability rate was high in the elderly in China, which was influenced by the aging and multi demographic characteristics of the elderly. It is important to strengthen the prevention of BADL and IADL disabilities and intervention in the elderly. 施小明. 应重视和加强我国老龄人群尤其是高龄人群健康方面的研究[J]. 中华预防医学杂志, 2017, 51(11): 963-965. 党俊武, 魏彦彦, 刘妮娜. 中国城乡老年人生活状况调查报告(2018)[M]. 北京: 社会科学文献出版社, 2018. Dang JW, Wei YY, Liu NN. Survey report on the living conditions of China's urban and rural older persons (2018)[M]. Beijing: Social Sciences Academic Press (China), 2018. 潘金洪, 帅友良, 孙唐水, 等. 中国老年人口失能率及失能规模分析——基于第六次全国人口普查数据[J]. 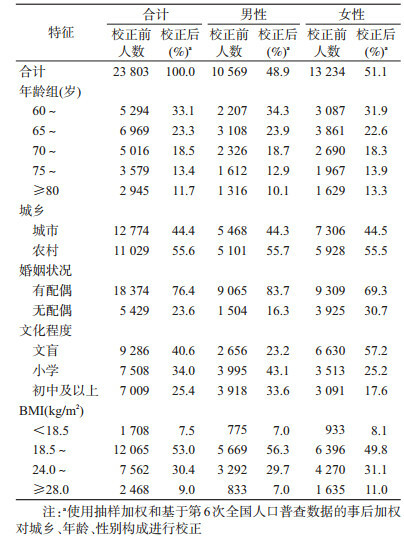 南京人口管理干部学院学报, 2012, 28(4): 3-6, 32. Wu XL, Liu J, Dong TY. Longitudinal dynamic analysis of Chinese elderly's activities of daily living[J]. Sci Re Ag, 2018, 6(1): 28-45. 宋艳丽, 张燕燕, 吴倩霞, 等. 社区老人社会参与和日常生活的工具性活动的关系[J]. 管理观察, 2017(18): 83-85. 翟晓婷, 黄丽妹, 阮晔, 等. 上海市松江区老年人日常生活能力现状[J]. 上海预防医学, 2018, 30(4): 320-323, 327. 徐小凤, 陈茜, 赵艺璞, 等. 我国西部地区居家老年人生活自理能力调查分析[J]. 北京大学学报:医学版, 2018, 50(3): 457-462. 王建平, 汤哲, 孙菲, 等. 北京社区失能老年人与照护现状分析[J]. 北京医学, 2014, 36(10): 792-795.